Caption Rapattack is one of Carnival's most well known and popular sound systems Its all about music and this is the place to be strictly for connoisseurs together with sound system enthusiasts providing a comprehensive service for all your event and partying needs. *****Keeping in line with our tradition of class and musical excellence in providing quality entertainment for quality people we will continue to bring you ultimate parties at exclusive venues *********** Originally back in 1965 this event started out as an affair for the Afro Caribbean community and has developed into what can now be described as a truly successful multicultural event. It is the most colourful happy joyous and definitely the most spectacular event in the British calendar. In Carnival terms is second only to Rio. It's fantastic it's vibrant it's full of life it's for everyone and it's FREE! Rapattack is one the premier and most largest sound systems at Carnival with highly skilled members who feed into operational issues liaising with the local authorities Metropolitan Police the Greater London Authority amongst other stake holders and we are currently chairing ECCA Executive Committee of Carnival Arts which is a major part of the operational body that organises the entire Carnival event as a whole. 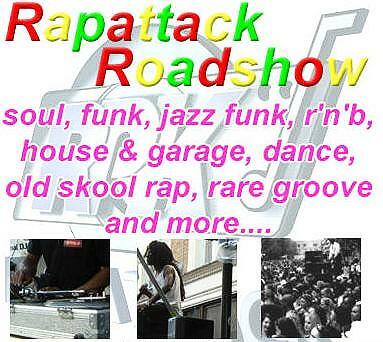 ***** Rapattack performed at their first Carnival in 1984 and became one of the founder members of B.A.S.S. British association of Sound Systems which today is the governing body and discipline which organises all 'static' sound systems at this event. ****** Rapattack performed at their first Carnival in 1984 and became one of the founder members of B.A.S.S. British association of Sound Systems which today is the governing body and discipline which organises all 'static' sound systems at this event.